"Do not be disturbed. There is no cause for anxiety. You are doing your best to serve Krishna, that is very much appreciated, so do not lose enthusiasm out of frustration, that will spoil everything. Krishna Consciousness means we should always be satisfied and happy, not that we must work something impossible, becoming overburdened, and then because we are unhappy by so much trouble we lose enthusiasm altogether and give up all hope. No, if too much endeavour is there, that is to be avoided. 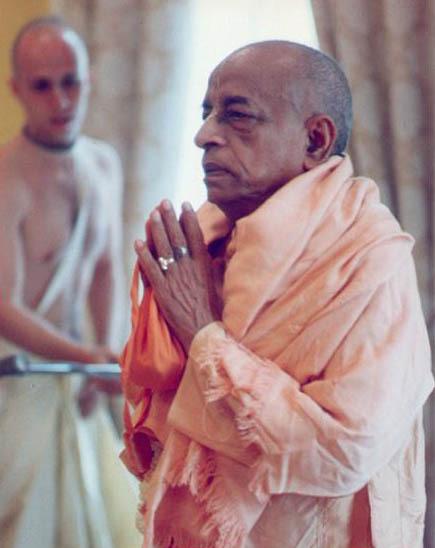 "By all means we must preserve our spiritual status, that is the point, not that we are mad after big buildings, many devotees, life-members, this, that - no, these are only ways to engage the devotees so that they may apply the principles of devotional living to some kind of work for practical realization of these principles. "It is not the result of the work we want. If only one person daily, if we sincerely preach to such one person in a day, that is sufficient, never mind big, big programmes."